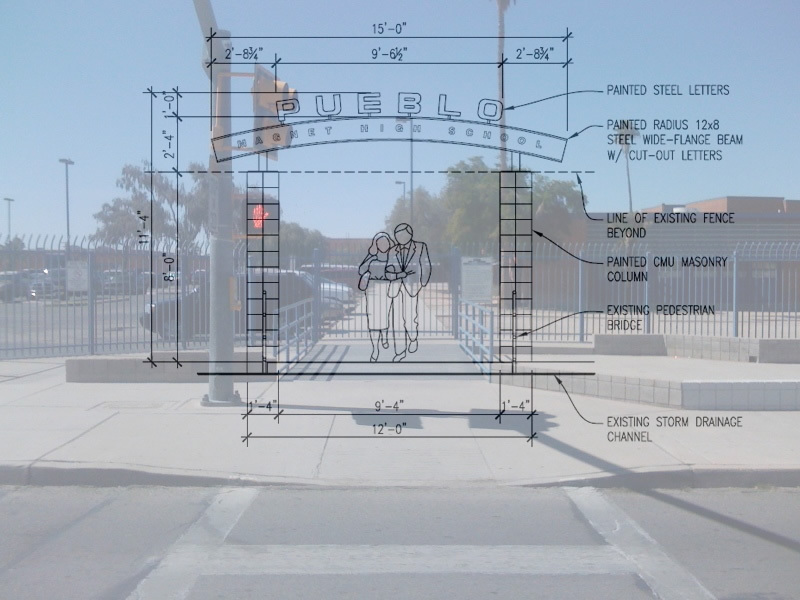 The student body and staff is excited about the upcoming changes to the entrance of Pueblo. At the time of this posting Pueblo had raised $42,540 for a new marquee. Thank you to all who donated! As the City Of Tucson provides more information on the realignment project, we will post the updates on our blog. Look for the changes! Aren’t there more important things Pueblo could be spending money on? Such as the awful computers? This is a “technology” school after all. Not to mention all the teachers who have lost their jobs, I’m sure they’re real thrilled that their income has been traded for a flashy sign. Nice one, Pueblo. I totally agree! Instead of buying a sign, couldn’t we buy some new computers to replace our craputers? Or buy some instruments for the band? Geez sometimes I wish I had went to THS. Thanks for the backup, Sonny 🙂 But yeah it drives me crazy that the school is more concerned about AESTHETICS rather than substance. The whole “Why get a Chevy when you can get a Cadillac”, uhhh because it might not be a wise decision to get a Cadillac when your house is falling apart. And then we wonder why we’re seen as the “ghetto” school of Tucson, and why we have some of the lowest test scores. Plus I hear we’re cutting half of our fine arts classes next year. But hey, we’ll have a cool sign out front, so it’s all good! I would like to say that I think the idea is great. I graduated in ’07 and I remember thinking that there was nothing that made our school stand out in appearance. For the kid that said that our school is seen as the ghetto school, it has nothing to do with the computers or lack of band equipment, it has to do with the fact that there are too many ghetto kids running around the school selling drugs and carrying guns. If you want the school to quit being seen as ghetto, fix the student body, if you want the appearance of the school to improve, this gateway is a great step. “The kid”? You could at least have enough respect to refer to me by my name, as it is listed directly above my post. First off, I never mentioned anything about band equipment. And having god-awful computers in a TECHNOLOGY magnet school does indeed contribute to the crap quality of the school overall. I notice you didn’t have anything to say in response to the teacher cuts. Ghetto kids are everywhere, not just at Pueblo. The problem is that our administration doesn’t know where to focus their attention, and find projects like this more important than improving the tools needed to reel in those “ghetto kids”. Decent computer systems, better classes/less teacher cuts (The french class was replaced with Chinese… really!?!? ), better books and supplies, the list could go on. I never said anything about the appearance of Pueblo. Sure, a $50,000+ marquee will most definitely improve the appearance. What I’m getting at is that the appearance shouldn’t be at the top of the priority list right now. It drives me up the wall and through the ceiling to hear you say “there are too many ghetto kids running around the school selling drugs and carrying guns”. That’s not even true. WHY fix the school up if the kids are ghetto? And like Chelsea said.. A new marquee shouldn’t really be a top priority at the moment. We should be focusing on more important things like Fine Arts, Tech stuff or something like new text books or more teachers. It’s a shame we can raise money for a fancy sign/walkway (which is going to get tagged up anyway) but we sure as hell can’t raise money for colored pencils ,paper, and pencils for the classrooms. Just my 2 cents.